My own fortunes were poor for this match, as with no televised broadcast here, I was at the mercy of terrible streams. But still I saw almost every tense and terrifying moment of Zeman’s attack…. after attack, after attack, after attack. Ibarbo was relentless, and so were Cossu, Sau, and the others. Like some kind of zombies on crack, mindlessly racing toward Abbiati with only one desire: brains… umm… I mean goals. And so it was that in the 24th that Ibarbo’s head would meet Sau’s cross and the result was devastating. 1-0 Cagliari. Wait, did I say devastating? I meant inspiring. The tenacity of this new Milan side kicked in, and it was only a matter of time before Milan equalized. 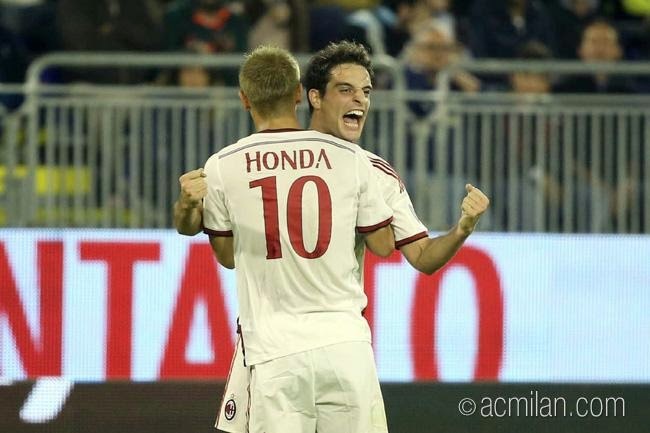 That specific amount of time was approximately eleven minutes, as in the 35th, when Honda sent the ball in to “Lucky Jack” Bonaventura, who looked up, saw Crogno off of his line, and sent in the lucky cross-that-became-a-goal to change Milan’s fortunes in this game. 1-1 all. The score does not reflect the manic battle to score, nor does it reflect the 13 fouls for each team or the 3 yellows for Cagliari. Nor does it reflect the yellows given to Rami in the 56th for his gentlemanly clothesline of his opponent or for Muntari in the ninth minute for… well, for being Sulley “The Killer” Muntari. Signor Killer will consequently thankfully miss our match with Palermo on Sunday. The only real negative was a Bonaventura head injury in the 53rd. He played the rest of the match, but stayed behind in Sardegna for medical observation. The possession was 50/50, though the two sides played very differently. Cagliari were frantic and always moving, always mindlessly attacking. Whereas Milan’s superior talent shone through. Our plays were more calm and coordinated, and our skills showed on free kicks and shots. But once again, our defense starred. Alex was absolutely brilliant, and Rami, too, making several amazing saves that would have been goals conceded just weeks ago. Abbiati earned his paycheck and maybe Lopez’, too, and kept us in the game when called upon. Abate was a beast and even De Sciglio made some great plays and tackles, improving on his recent poor form. It’s not to say that just because they didn’t score more than one goal that our attack was poor, because they did a lot, too. With 13 shots, only three were on goal, but it’s not like Cagliari’s 16 shots with five on goal were that much more. Additionally, I like the understanding developing between our various attackers, and the flexibility they had when Inzaghi subbed. Speaking of subs, Inzaghi brought on Menez for El Shaarawy in the 67th, Poli for Signor Killer in the 69th, and finally Pazzini got a few well-deserved minutes coming on for Torres in the 78th. According to Twitter’s official unofficial stance, Milan sucked!!! This was a must-win game in the race for third place!!! (even though we are actually in third place.) We threw away three points!!! We should have beaten this 15th place team, etc. (Cagliari actually came into this match in 12th place.) But for people who actually did their homework, they would know that Cagliari were ready to steamroll us, and we actually managed to stave them off for 90 minutes. In front of their home crowd, on their little island, with the Sant’Elia’s occupancy being expanded for the first time for this match, and with Zeman at the helm. 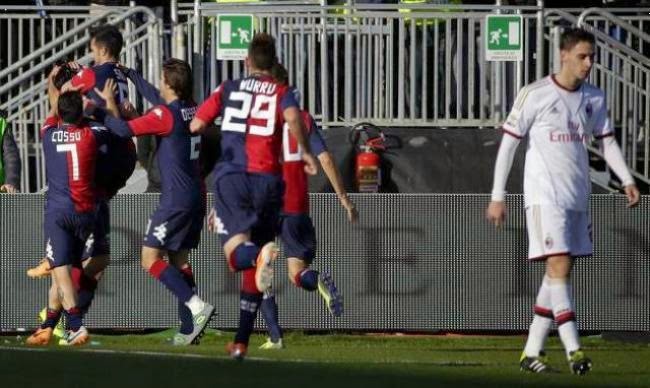 Cagliari were picking up steam and instead, we picked up a point from them at home. Sure, it was two draws back to back, but they were also two very difficult teams. And if that’s not enough to debrief your Twitter hysteria, keep in mind that this team have had three different coaches this calendar year and finished eighth last season. To be sitting in third at the end of October is better than we could have ever dreamed of this summer. So don’t believe everything you read on Twitter. It may have 140 characters, but the average IQ level of the comments made there is significantly lower. "Remember what you did on Sunday? Do that again." Inzaghi has done an amazing job with this squad, there is improvement in every game. The defense that hemorrhaged goals under Allegri is starting to become fierce, and we have two keepers to compete for a starting spot. That is a treat after buying Agazzi and watching Amelia all of those years. So yes, our fortunes are changing. We won’t win every game, and we may take some baby steps backward here or there. But there is a strength and a desire that have been missing this past two years that seems to be quietly growing inside the squad with each match. And we can finally see that third place is actually viable, since we are already there. Oh, and did I mention that Allegri’s Juve winning streak was broken by our old friend Antonini with an assist from Allegri’s love child, Matri? Muahahaha… fortunes are changing indeed.